The author brings his ideas alive by relating them to practical, everyday situations. This book offers great assistance to anyone searching for their next step in personal development. 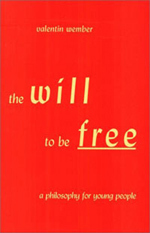 Ideal for young people - for whom it is primarily written - it also provides much useful stimulation for anybody interested in philosophical and life questions. DR VALENTIN WEMBER is a Steiner Waldorf school teacher in Stuttgart, Germany and a writer and lecturer.